We carry a full line of wrought iron fence and gates. 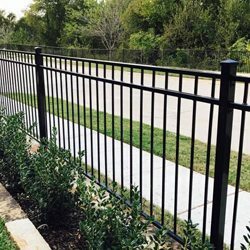 Forney Fence Supply is a manufacturer and wholesaler of quality, powder coated ornamental iron fence. Located near Dallas, we offer a large inventory ready for delivery. We are the manufacturer which means NO MIDDLE MAN! Contact us today for more information and pricing. We provide quality ornamental fence panels and railing. Our Dallas warehouse has a large selection of ornamental fence panels available for delivery or pickup. We stock in our Dallas warehouse the most versatile panels and toppers in the industry. Choose a panel, pick the topper you prefer or mix and match. They all fit and are interchangeable allowing your to create the exact design you want. We have a two different puppy panels for those who have small dogs. One that inserts into our 1/2″ picket style panels and a 2 foot flat top panel that can be used with any flat top panel. We stock a post and cap to meet every need. We carry post in in variable sizes, lengths and gauges to meet the job specification include cast iron balls and pyramid shape caps. We have a great selection of driveway gates. We have standard sizes and styles that we keep in stock. We also have the capability to manufacture any style gate you choose along with your custom plasma cut logo. Our s custom gate manufacturing can save you 50% over local manufacturing. Our warehouse offers a selection of finials, spears, bolts, drill bits, plugs and more for all of your fence hardware needs. We are also a Hilti Distributor and have access to all Hilti Products. At Forney Fence we have a large selection of hinges and latches to fill any need you have. From safety latches to clamps and Truclose latches, we have you covered.